This coloured sheep is an ancient breed and was described in Welsh writings from the middle ages. 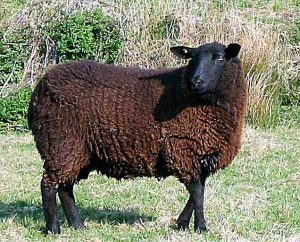 Black Welsh Mountain sheep require little or no supplementary feeding and are hardy enough to live on exposed hillsides throughout the year. They lamb easily, and frequently produce twins. They are excellent mothers. The breed seems to have some resistance to fly strike and foot rot. The sheep produce small succulent joints of meat. They have a close texture with little fat and a distinctive flavour. The wool is pure black with the tips bleaching to a reddish brown. It is dense, fairly fine and soft. It is a medium length. The naturally dark colour has been popular throughout the ages. The fleece is most suitable for weaving into a cloth that is durable, light and warm. Used with white wool it can produce attractive checks and patterns.